Make this easy ice cream pie recipe that has a chocolate cake and dark chocolate fudge frosting crust. Grease two pie plates well, including the sides and rim. Set aside. Bake for 25 minutes. Remove from the oven, press the chocolate cake mixture down into the bottom of the pie tin (so it will form more of a crust), and bake for an additional 5 minutes. Let cool. While the pie is cooling, allow the ice cream to soften. Divide the ice cream between the two pie tins, and smooth into a pie shape. Wrap well in plastic wrap and foil, and freeze until firm, at least 2 hours. If you’d like to make this recipe gluten free, check the frosting ingredients and use a gluten-free cake mix. 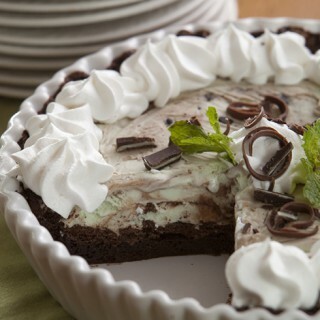 This ice cream pie sounds sooo good. Anxious to make it. what if you only need 1 pie can this receipe be halved? Sweet and decadent, these treats are a Mississippi tradition.